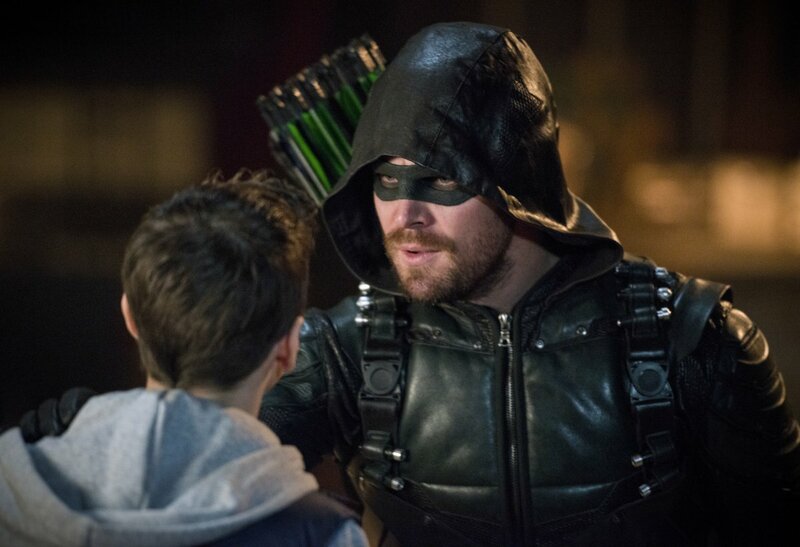 The thirteenth episode of each season of Arrow tends to be more hit than miss, I’ve noticed. Over six years, it’s hard not to pick up on the correlation — the thirteenth episode often is my least favorite episode of any given season. Last year, we saw the infamous “gun control” episode and that was probably my least favorite episode of Arrow ever. So it’s safe to say that I went into “The Devil’s Greatest Trick” with very low expectations. It was a good thing, too. Because this episode failed to make any big waves which is a shame because it did serve as a mid-season culmination of the Cayden James storyline. The bomb we’ve been hearing about for months now was finally primed and ready to be detonated. Original Team Arrow was scrambling, trying to find a way to avert the crisis and keep the city safe. They were out of options and needed to appeal to Cayden in a last-ditch effort to forestall the destruction of Star City. This was aided by Alena — who is still helping the team — finally discovering who killed Cayden’s son. No, it wasn’t Oliver (not that we really thought it was), but a hired assassin. Who hired him though? It had to be someone close to Cayden. Oliver and Dig brought the evidence to Cayden and he was stunned, immediately suspecting someone on his team to be the culprit. But who? He had a request for Oliver: bring him Anatoly, Diaz, and Siren before midnight or he would detonate the bomb. OTA called up NTA to help gather the wayward henchmen, and — predictably — the newbies griped about it but agreed anyway. Dinah, however, was on a mission of her own to take out Siren. Her teammates had little luck reining her in and no one else had much luck either. Including Quentin, who still insists that Siren is his daughter. Or at least has a piece of Laurel in her. Which... I’m not sure how that works. But everyone, including Siren thought, this notion was absolutely insane. We were also treated to Cayden’s flashbacks in this episode, which showed his tumultuous relationship with his teenage son. He was working instead of making it to his son’s basketball games, and ironically, was taken into custody by ARGUS agents when he tried to make it to one of those games. It was while in ARGUS custody that he learned his son was murdered and Cayden’s grief was sharp and palpable. You could see how a man would be driven to retribution after that. The unfair imprisonment and loss of his son made him unhinged. There’s a parallel there: Lance is also unhinged by his grief over losing Laurel. He’s compromising his morals as a result — just like Cayden had. When Oliver, Diggle, and NTA bring Cayden his henchmen, William tags along because he’s afraid something will happen to Oliver. Oliver’s fear for his son reminds Cayden of his own son and when things (predictably) go awry, it’s seeing the father and son comforting each other — and Oliver struggling to protect his son — that makes Cayden lower the trigger for the bomb. After all, he wasn’t able to protect his own son. If there was anyone who was at fault for what happened to Owen James, it was Cayden himself. Siren gets away when Cayden’s bomb transmitter interferes with her scream-dampening device and in the chaos, Diaz and Anatoly also escape. Siren is confronted by Dinah, who is determined to exact revenge for Vince. Siren very pointedly expresses a lack of remorse for killing Dinah’s lover and that drives the Black Canary to the brink. She’s about ready to kill Siren when Quentin interferes, pleading with Dinah to have mercy. There’s a struggle and Dinah grabs a gun just as Siren lets out a scream. She’s shot, but not fatally and is able to escape. Oliver shared several very tender moments with William in this episode, most notably at the end in the bunker where he promises his son he’ll never let anything happen to him. Oliver also promises to always come home to William, which his son smartly points out that he can’t exactly promise. I also can’t help but think that William is already angling toward joining the team someday, if not taking over his father’s role. There is a lot of Oliver in the boy, and the need to help and protect is strong. We also see that Siren escaped because Quentin helped her. He has her in the back of his car, promising that he’ll get through to the part of her that is just like Laurel if it’s the last thing he does. She looks at him like he’s insane and for once, I agree with Siren. Has Quentin suffered one loss too many and now has gone completely around the bend? Forget the “Can Black Siren be redeemed?” question; what about Quentin Lance? Because right now, I see total character assassination happening. Back at the police station, Oliver speaks to Cayden and the latter gives the former the number of an account that holds all the money he embezzled from the city. That’s nice, because it means at least now the city isn’t bankrupt. He also tells Oliver to be a better father than he was. I think that’s Oliver’s plan. It seems Cayden is prepared to pay for his crimes. What he doesn’t expect is to see Diaz come strolling in. Apparently, he’s buddies with the new police chief. He tells Cayden that he was wrong to try to destroy the city. No, the real objective is to take over the city — which is what he plans to do. He reveals to Cayden that he was the one who killed his son before knifing him in the neck, killing him. I’m not a huge fan of Diaz, and I’m even less of a fan of Siren. I liked Cayden, if only because I’m a fan of Michael Emerson. With him gone now, I’m nervous about the villain for the rest of this season. I have a small hope that the show will reveal that Alena has been working with Diaz the whole time, because that might help some things make sense (the doctoring of the videos and pictures, for one). So, yeah. The thirteenth episode curse lives on. There was very little Olicity, only scant OTA action, and the family feels with Oliver and William were too sparse to make up for the rest of the clunkiness. But, again, I didn’t expect much out of this episode so I’m not too disappointed. But I do wish for better in the weeks to come. I would suggest dropping the nonsensical “civil war” storyline with OTA and NTA and the whole Black Siren redemption thing, for starters. But I won’t hold my breath on that one.